Learn how to verify your license key and connect your site to future updates. Each license key includes a number of activations for other sites depending on your Simmer Pro plan. A Simmer license key connects your site to future updates to your product so you don't have to download and manually install them each time. Instead, WordPress and Simmer handle automatic delivery of the updates to your site for you so you can update your product directly from your WordPress dashboard. The Simmer Pro plugin must be installed and activated to verify your license key. After the plugin is activated, go to Settings > Simmer Activation to verify and connect your key. Verification requires input of your billing email plus your license key. When your key is successfully connected and activated, you will read a notice at the top that says "Simmer PRO Recipes activated." followed by the number of activations remaining. After your key is verified, go to Recipes > Add New to start adding your recipe creations. Recipes are available as single pages and can also be embedded into any post or page. 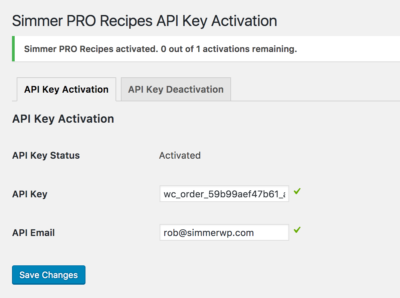 Screenshot above: An example of a successful license key activation for Simmer Pro Recipes.